It is known that our skin contains sweat glands and where this sweat cannot evaporate easily, it soon becomes good food for bacteria and yeasts to grow. 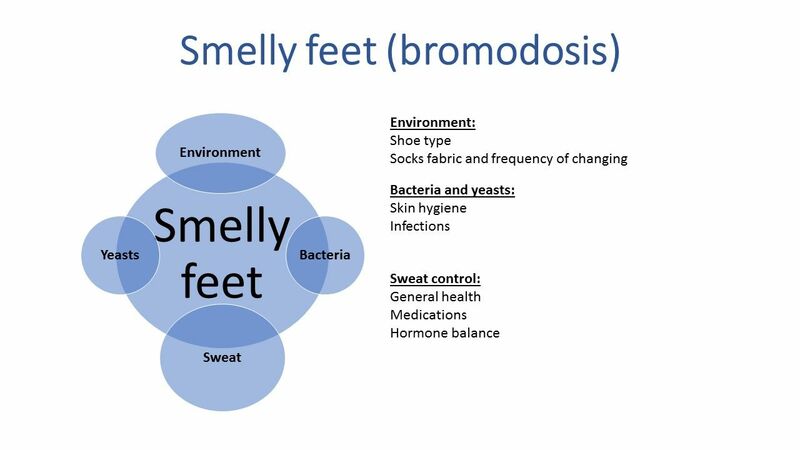 The combination of stale sweat in shoes and socks and the actions of bacteria and yeasts causes the feet to smell, a condition known as bromodosis, which can be very embarrassing and affect confidence. However, before you despair and worry about friends and family reaching for the gas masks every time you take your shoes off this summer, the good news for you is that smelly feet can be controlled. The feet have more sweat glands than any other body parts these glands constantly produce sweat whatever the weather. This means smelly feet is an all-year-round problem but can be worse in summer months. To understand how you can stop your feet from stinking, it is important to know the vicious cycle causing this problem. The type of shoes and socks you wear and how you wear them affect the odour around your feet. Ideally, wear socks made from wool and man-made fibre. Nylon is no good contrary to what you might think, cotton is no good either as it has low moisture absorption ability. If you are up for it, try bamboo fibre or anti-bacterial socks. In addition, ensure you wear a clean pair of socks every day and avoid tight fitting socks. For shoes, avoid plastic linings, do not wear same shoes consecutively for days so they can dry out properly. This is especially true for trainers as they are insulating and it’s no wonder how the condition called athlete’s foot got its name. Every fortnight, try to ‘sanitise’ the inside of your shoes using anti-bacterial wipes. These creatures are always on our and here to stay but it is possible to control their growth. If you suffer from smelly feet the easiest and cheapest thing you can do is clean or wish your feet daily. A number of ‘best cleansing agents’ have been mentioned. The simplest, of course is water with or without soap; others include salty water, tea tree oil, black tea (with no sugar, of course! ), vinegar and surgical spirit. Whatever catches your fancy the essence of daily feet washing is to continuously wipe away the bacteria and yeasts on the skin and their population under check. Check your feet regularly so that any infection can be promptly treated. The most common infection contributing to body odour is foot thrush or candidiasis caused by yeasts. Another infection is pitted keratolysis which are small pits appearing like honeycomb but giving off unpleasant smell from your feet. The general state of one’s health is also important. Conditions that suppress the immune system can give yeasts and bacteria unrestricted growth on the skin. Excessive sweating of the soles is called plantar hyperhidrosis and is the major cause of smelly feet. There are a few ways to control feet sweating. People often start with the use anti-perspirants which are readily available in pharmacies and superstores. Iontophoresis is often offered in hospitals and home kits are now available to buy for personal use. Treatment takes about 30 - 40 mins and initially starts with a few sessions per week reducing to a session every 3-4 weeks. The treatment may not be readily available around you and finding the time to attend appointment may be a chore. Surgery to destroy the nerves controlling sweating in your feet is possible but this is like hitting a fly with a sledge-hammer. Unfortunately, our nerves are not labelled like engineers do to the cables in our homes so it is often difficult to isolate the sweat nerves there is risk of damage to other nerves causing impotence and sexual dysfunction in women. Botulinum toxin (Botox®) has been proven to be effective in controlling sweating in any part of the body. In my opinion, excessive sweating of the feet should be a thing of the past with Botox® treatment. This treatment is not only very effective but also lasts for few months meaning you do not have to worry about repeated appointments as with other treatments. Also, there is virtually no risk and downtime with Botox hyperhidrosis treatment. The reason why this treatment has not been so popular is due to the technical expertise required. The sole of the feet has a thick skin and usually, anaesthetic creams are not effective in numbing so a special anaesthetic technique needs to be used. In my practice, I offer a foot block by injecting local anaesthetic just around the ankle. This effectively numbs the foot making the procedure painless to perform.